Every day in business is another play for success. Players at every level of the game – aspiring amateurs, rookies, and even seasoned professionals - are dedicated to pushing the limits by putting everything on the line for their goals. Join us for a month-long discussion dedicated to “Going for the Gold” in celebration of this year's OBJ Golden 100 honorees, and bring your business game to the next level. The digital and social playing fields used for marketing and customer service have changed drastically over the past few years due to digital disruption. This side effect of the digital age has changed the ways consumers complete transactions and communicate their needs to providers. What was once seen as a progressive opportunity has quickly become the standard audiences are demanding from brands. Giving customers what they want comes from taking time to get to know them. Personalizing the experiences that matter benefit companies more than ever, but only the masters know how to make the most of these custom interactions. Download the Complete Infographic For More Details. Digital disruption causes customers to take multiple paths to achieve brand interraction. The answer for genuine connection that matters isn't always in giving them variety, but the reassurance of a consistent prescence and location that they can count on. Opening channels to benefit from multiple levels of integration will further these efforts, making the digital disruption effect work in your businesses favor. Download the Entire Infographic Here. Using advanced technology is only impactful for consumers when businesses have the right team to support them. Leveraging the latest technology starts with a holistic digital ecosystem. Download the Complete Infographic For More Master Tips on Digital Communication. Act Now & Get the Full Details: Make sure your marketing strategy is giving your customers what they want. 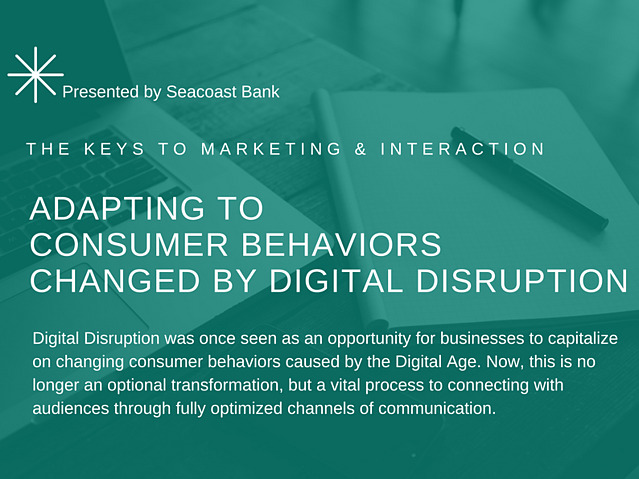 Download the Complete Infographic to discover how to master disrupters transform these realities into stronger marketing and customer service. Investing in a holistic approach to incorporating digital disruption starts with the right banking tools. Learn more about how our expert team can address what Business Banking options are available to furthur your interactive strategies.